Constantinople is too long a name for the crossroads of the world. Istanbul is just right. ​Bits and pieces of every major Mediterranean culture from the year Dot to today can be found spread around Istanbul and its neighbouring provinces. Like snow on a Yellowknife street. One minute you're looking at a Byzantine cathedral. You blink your eyes and it's a massive mosque. You shake your head and it's a museum featuring everyone from Moses to the fabulous innovator Ataturk. Small Christian churches fantastically decorated vie for space with spice markets that certainly saw the early Greeks. Imperial era hotels bunt their Fez topped rooflines with palaces that defy the imagination. The Topkapi Palace or the "Seraglio" was in the 15th century the home and administrative office of the Ottoman Sultans. Topkapi means the Cannon Gate and it was Mehmed the Conqueror who had it built. The Sultan's harem lived here and the Grand vizier had his office in this Palace as well. Despite the occasional doofus attempt to convert historic sites to shopping malls, no city on earth works harder at displaying the full range of 2500 years of history than Istanbul. With a magical surface transit system and locals falling over themselves to help tourists with pathetic lost looks, it must be one of the most accessible living museums in the world. The Basilica Cistern is one place you should visit when you're in Istanbul. The largest of hundreds of ancient cisterns underneath the city of Istanbul providing water filtration for several places in the city. Built during the reign of the Byzantine Emperor, Justinian I, it is like a sunken palace with its own attractions and the one not to be missed is the head of Medusa. 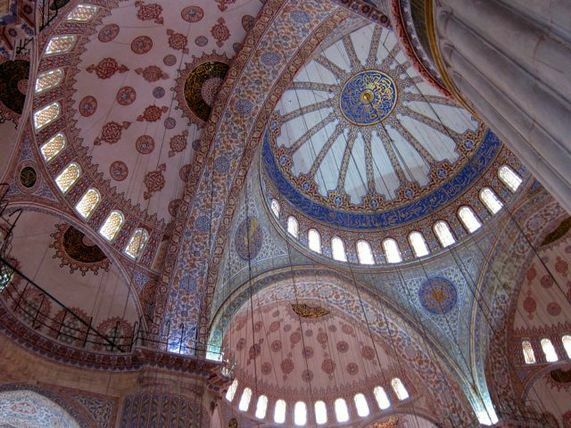 Huge and beautifully adorned, the Blue Mosque is the popular name people use because of the blue tiles on its walls but it is really the Sultan Ahmet Mosque. Built during the term of this Sultan, around 1609, the mosque contains his tomb, a madrassah and a hospice but it mostly welcomes the gaggle of tourists who frequent the place just to see its amazing beauty. We were captivated when we first saw this place. Remember, it is still used as a mosque and people come to worship here. 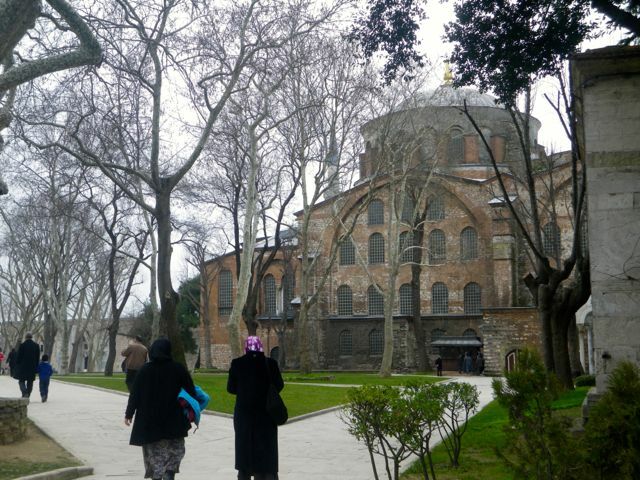 Formerly the seat of the Patriarch of Constantinople and a Catholic Cathedral from 537 to 1453, later an Imperial Mosque (1453-1931) and today a Museum, the Hagia Sophia is the other most popular destination in Istanbul. Its massive dome is its top architectural feature but it also holds many interesting holy relics. The relics come from all the different religions that held it as its place of worship which makes it a very interesting place for history buffs. This 1480 year old building was where the Byzantine Emperors were crowned. In 1453, it was converted into a Mosque. In 1935, Mustafa Kemal Ataturk turned this into a Museum to showcase the new worldview that the Turkish Republic has moved into at that time. Today, that might again change. Spice up your visit of Istanbul with this book. What could be more interesting than following a thief in one of the oldest cities in the world? I enjoy reading a book on cities we're going to visit. I feel I get a much better understanding of the city's complex labyrinths and social interactions. This book, The Thief's Tale, is set in Turkey during the Ottoman reign. Written by Turney who has written a number of historical novels, it is a good read. It starts out with two Greek brothers recruited to be part of the Ottoman army. The younger one, however, knew from the very start that life in the Ottoman military was not for him so he convinced the other brother to run away but there was no way, he could convince him so when they reached Istanbul, the younger brother disappeared and as often happens in these big cities, he ended up thieving to survive. The brother who remained rose to the ranks and ended up one of the King's guards. Both would continue to see each other though infrequently until one day, they were brought together by an event that made them work together to survive.